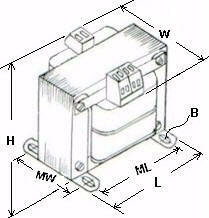 240VAC, 480VAC step-down Industrial and Machine Tool Control Transformers Step-down to 24VAC. Wattage starting at 25VA. Options include slo-blo midget fuses, CC fuses, and finger safe European IP20 approved terminal blocks. Custom designs available. UL/CUL/CSA approved. CE marked.